Im more than happy to put something together about this for The Cultural Thing website. Doing a bit of a site, re-vamp at the mo. I hope you are able to use the media interest surrounding this new series to draw attention to the real and important story. I will do my best to publicise this. The key question is whether the series is based on your BOOK or on your LIFE. Book is copyrightable, life is not. Ever thought of taking a legal advice? Craig; Don’t know much about UK legal system, but in the US if you have a good case, plenty of lawyers will take it on contingency. That means all costs are borne by the solicitor, and if you win he takes 1/3 of settlement. Excellent. As you so rightly say the law is against those without money to burn. The poorer you are the less chance of having a fair hearing under British law. The FCO is a disgrace for ever getting involved in this. Big Talk likewise. BBC 2 likewise. Great image from Anode. A good time to really step up the campaign against Big Talk would be when the series starts. Will do my bit. Good luck. It occurs to me that there’s a lot you’re not letting on here, Craig. You must be pretty certain that this series (Tazbek Spring/Our Man/Ambassador – it seems to have been called all of these) either defames you or infringes your copyright. How you know this is of course your business; but it’s not likely to be from someone willing to testify, so it’s probably not evidence. If you were able to pay the furred lawcats (tip of the hat to Rabelais, there) to act now, you might be able to stop it showing. On the other hand, if it gets released unhindered, you will then have the evidence you need without paying said lawcats to get it. You might then bring a private prosecution. And you’d avoid any sly suggestions that you were trying to hinder free expression. It occurs to me, though, that the most likely opponents arising out of a poster campaign would be Mitchell and Webb, their agent, or the photographer, for alleged breach of copyright in their images. Whose connection with any alleged breach of your copyright is tenuous, and with your alleged defamation is nonexistent; such an action would not highlight your complaint. So I don’t, with great respect, think this is a terrific idea at all. Yes, this is your chance to do something concrete for once, rather than writing pointless articles on the website where you’re an “editor” and posting even more pointless comments about the Rothschilds, Bilderbergers and freemasons on here. Share with us, in slightly more specific terms, what “your bit” will be? PS to Craig – good luck to you and I hope you get satisfaction. But one thought occurs : if you get your day in court through them suing you, won’t you need (expensive) lawyers then as well? Please understand that in the TV/movie business, yours is not an unusual situation. This sort of thing happens quite often, and often even more egregiously. 10K to apply to look at a script? I’ve never heard of such a thing. If you want to see a script, it’s not hard to get your hands on one as scripts get sent around to various agencies and even circulate via fans. Trying to keep a script secret is (1) nearly impossible even at the highest levels and (2) not worth anyone’s time or effort. I could probably help steer you in a better direction. If you would like me to contact you directly, let me know. Q: Craig; Don’t know much about UK legal system, but in the US if you have a good case, plenty of lawyers will take it on contingency. R: It took some prolonged arm wrestling to get my lawyer on board my judicial plans 9 years ago, but ever since that day, out of the 50/50 and 20/20 he triggered, he’s made a ff-ing windfall. Money does talk [provided you have it]. 3 strikes and you are out. Daniel; I take it ‘contingency’ in the UK legal system means ‘let the buyer beware’. The hasbaric Red Robbo Habbakuk has taken this new post as an opportunity to attack John Goss in his usual manner, solely with that hackneyed Chapter Three hasbara tactic of denigration in mind. Sometimes I think Jon might just be a bit intellectually short sighted not to see through such posts and delete them on sight, no need even to explain. Sooner or later the DIY devil will realise all his time and effort is to no avail and desist. Thank you O/T, alias English Knight, alias Krishnamurky, alias several others…..thought you’d been asked to desist? They’ll probably be cook-a-hoop over the free publicity. I don’t like to pre-judge such things without seeing them first but this is a new BBC sit-com and will most likely sink without trace after one series, if that. Would a ‘writers guild’ or ‘writers union’ etc do the decent thing and represent you? What about Broadcasting ethics committees? On the contrary. His recent longish posts on (1) China (do not set up as a new false God) and (2) Palestinians meeting Israeli violence with violence (is this the right way?) were two of the best I’ve read on this blog – outstandingly thoughtful and well-argued. Thanks, O/T, for having given me the opportunity to say so! Well done and well said Craig. Also well done to A Node. A picture says a thousand words! Danger – knaves and crooks at work. Erm….if posting photoshopped images on blogs could get you nicked then half the web could be shut down. Even publishing a fake pic in the tabloid press wouldn’t cause a murmur….The Sun has got away with much worse. You could sue if Big Talk adapted your book scene-for-scene or lifted your dialogue word-for-word. Otherwise you cant touch ‘em….even if the show turns out to be a pisstake of actual scenes from the book, because parodies don’t infringe copyright and satire doesn’t defame. Producers don’t get sued for misrepresenting personal experiences in docudramas even when the person is named and protrayed. Julian Assange isn’t happy about the Fifth Estate and that doctor bloke in the Diana film seems annoyed too, but what can they do? You can have a moan about it in the papers if you like. Why not seize the media buzz and tell people what its really like for our men in central asia? But bear in mind that sounding indignant or desperate won’t do you any favours at all. Just to point out (to everyone) that I haven’t mentioned defamation – I think the UK’s defamation laws are an appalling restriction on free speech, and have no intention of using them in this case. I agree verbatim with your first two paragraphs Ann Thrope. I have already posted my earlier image design on a number of social networks where an image is possible. My intention is to create an intuitive link between Craig’s book and the Big Talk series. That is why the main characters in the series and the series logo are juxtaposed within the confines of the book cover in my image. 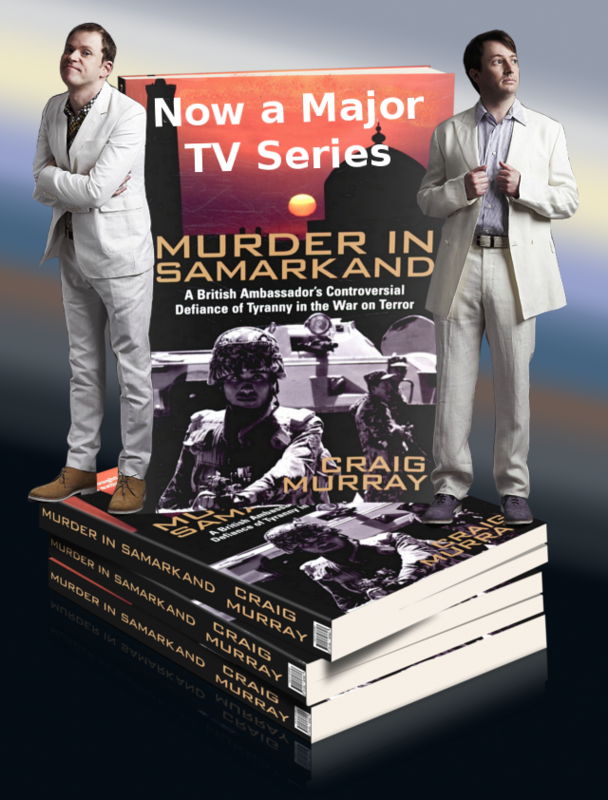 In that way Craig’s experiences defined by his book and the Big Talk series are merged within the minds of viewers, eventually allowing truth rather than satire to precipitate as principal and in which Craig Murray is imbued in awareness and appreciation. Wunderbar! So now what do we do? Let’s hear Miss CNP Data’s ‘wise’ guidance, for once. Old trout preservation area – swimming forbidden. Monty’s Blog – Independence for Scotland has put up a link. Good of Villager to duplicate my post! Perhaps he/she has not heard of Sir Francis Bacon’s saying ‘Knowledge is power’ from the C16. Who is lurking behind the name of Anon1? Own up. Sounds just like my old ‘mate’. Wreckers! The Shachty trial and the trial of the Engineers! Soviet generals as agents of the imperialist Japanese and fascist Germans! Jewish doctors plotting to murder the Little Father! Little green men dancing around my bed! Oh, when will it all end? I feel like I’m missing something. If you haven’t even seen the script, how do you know it infringes copyright or plagiarizes your book? So far all you’ve said is that they once expressed an interest in your book, and that they’re now making a TV series about the same subject, but so what? There are often many dozens or hundreds of books and films about a given subject – writing a story on a subject that others have also written about would hardly be an infringement of any copyright by any stretch. ??? Though I suppose maybe you’ve heard rumours or have some inside sources that describe the series in more detail or something… I suppose I can understand that you might not feel comfortable sharing that. But so far, as it stands, I feel like in terms of publicity you’d do better to keep quiet about your suspicions until you can gather some solid evidence that you are able to show the public, otherwise people just won’t see it and will just dismiss you entirely, and it will just end up drawing attention from your other concern, about educating people about the politics and ethics of Uzbekistan. If they plagiarized you it will be obvious anyway when the show airs. To be honest I’m skeptical that they would have plagiarized it given that it would be so incredibly easy to check. It’s not like it’s something they could hide once it was broadcast. I do think, though, you might have more success using this show as a way of drawing publicity to the history and current events of this part of the world. That seems to me to be an area that has some possibility. Perhaps you would care to name some of those dozens or hundreds of books about the British Ambassador in Tashkent, Uzbekistan? They tried and failed to buy the rights to my book about that. They failed, and then they make the series anyway about the British Ambassador in “Tazbekistan” which they claim is ooincidental and has no relationship. Either you are inordinately thick or linked to the production. I suspect the latter as I refuse to believe anybody is that thick.